FRIENDS IN HIGH PLACES?Claremorris’ Paddy Burke managed to get to meet Garth Brooks at Croke Park as many in Ireland went hysterical about the American country star who plays in Croke Park later this year. 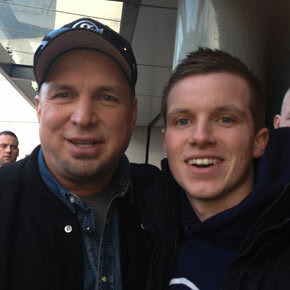 THERE were no “unanswered prayers” for Claremorris man Paddy Burke when he met his singing idol Garth Brooks at Croke Park during his recent short visit. The American country superstar was in Dublin to announce details of his big comeback shows which will be staged in Croke Park on July 25, 26, 27 and the newly added show on July 28 next. It was a dream come true for Paddy who spent eight hours waiting for the chance to see his hero. “It was a great honour to meet and shake hands with my favourite musical artist in the world,” Paddy told The Mayo News. “I got the morning train from Claremorris hoping that, by some chance, I might get to meet him at Croke Park. There were around 100 people there at one stage but some began to drift away in the afternoon after word came through that his flight had been delayed. “Gerry Kelly, who used to present his own popular Friday night show on UTV for a good many seasons, kept us informed about what was happening. Gerry interviewed Garth back around 1997 and they have a great friendship ever since. Gerry traced his Irish ancestry on his mother’s side and presented Garth with a family crest. “Garth is a big man and has a great way with people. When he came out he spoke first to those who were waiting with children and then asked if there were others there who had to catch trains or buses. Paddy, who also includes Merle Haggard, Randy Travis and George Jones among his favourite country singers, is already looking forward in a special way to a summer journey to Croke Park. “Garth is a true gentleman and I cannot wait to see him perform in Croker in July. I joined the queue along with my friend Shane Crowe outside Downtown Records in Castlebar at 5.30pm and stayed there overnight on Wednesday until the shop opened at 9am. I now have tickets for all three shows in Croke Park and Shane managed to get them for two shows. Roll on July,” says Paddy. Three 80,000 capacity shows sold out last Thursday as Garth-mania gripped the nation, seeing queues of devoted fans braving the elements. Over 100 fans of the country star camped out overnight on Wednesday outside Castlebar’s Downtown Records. There is still hope for fans who failed to pick up the coveted tickets as it has been announced that tickets for a fourth show will go on sale this Thursday. Tickets for the July 28 show will go on sale at 9am from Ticketmaster outlets and online. Speaking to John Murray on RTE’s Radio One yesterday (Monday) morning, Brooks (53) admitted he was amazed by the demand for tickets for his Croke Park concerts. “I’m stunned,” he said, before adding that it was ‘very sweet, very flattering, and very humbling’.